Functionality of Product: The Viper Jr. ski has a good sidecut and flexes easily. They are a bit softer than race skis and work very well in the soft snow of the Sierra. Jake ripped up the bumps, powder, ice and terrain park at Squaw Valley like a pro. The bindings worked as they should and were easy to get in and out of. The boots were very comfortable and easy to buckle, even for this big pawed eight year old. The thermo moldable liner is a plus even for kids. Spending so much time on the snow Jake’s feet used to hurt in other boots. The Freeride boot’s liner was very comfortable, yet stiff enough to transfer power to the foot. They also have a ski/walk mode which we really didn’t use – it seemed like too much trouble. How it is made: Rossignol products are made with quality throughout. The skis held up to 80 pounds of force for the whole winter. Rocks, trees, jumps, bumps, Jake really put the skis to the test. The Freeride boots don’t look too hot after Jake’s season of abuse, but they still perform as they should. The soles are holding up pretty good (after the trek from parking lot to mountain to video arcade to mountain to cookie shop to mountain to ice cream shop to mountain to parking lot). 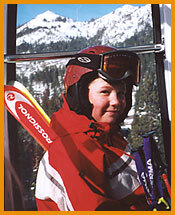 Use: Jake is on the ski team at Squaw Valley and used the skis all over the mountain. “I like them best in the terrain park”, says Jake. “I’m working on my Iron Cross and Tip Grab”. Jake has done OK in races as well with a couple of fourth place finishes. Performance: “I think the Rossi’s made me ski better. I know the boots made me happier cause my feet stopped hurting. The only problem I had with my bindings is that they didn’t come off when I went into a tree well in really deep powder. But that may have been my fault, I was kind of stuck with my ski in the branches.” Mom didn’t witness that, but shudders at the thought. Cool Factor: Rossi’s are very cool. The Mountain Viper Jr.’s graphics are trendy, but the Freeride Jr. boot is very hot. The boots stand out on the mountain. Jake had lots of inquiries about the type of boot, did he like it, that type of thing. His response, “yeah”. For more info on Rossignol see our Rippin’ Rider Preview here. See another Rossignol Rippin’ Rider Review here.